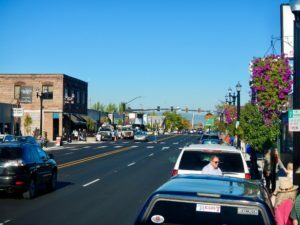 Our team is familiar with Oregon Department of Transportation and Federal highway funding, and we’ve completed many public and private local agency projects. We are the right local team for all of your transportation engineering needs. 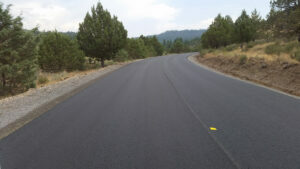 Adkins was selected by Lake County Road Department to design improvements and perform construction services for a 4.9 mile section of Dog Lake Lane in Lake County, Oregon. The original roadway was very old and was deteriorating rapidly. New culverts were added to improve drainage and the existing road was completely removed and replaced. Close coordination between the Federal Highway Administration, the funding source, and Lake County resulted in a seamless project from design to construction. Adkins performed design, surveying, right-of-way exhibits, materials testing, and construction engineering services for adding sidewalks, pedestrian-activated beacons, curbs, sidewalks, and drainage along the Washburn Way and Eberlein Avenue corridors. 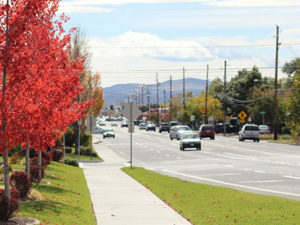 This project was Phase 1 of a multi-phase initiative by the City to connect and improve pedestrian facilities throughout this heavily traveled corridor. 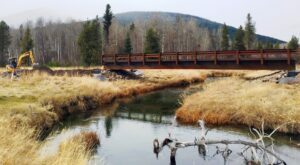 Adkins was hired by Klamath Basin Rangeland Trust (now Trout Unlimited) to design a 64-foot long bridge to span Sevenmile Creek. Adkins reduced construction costs and shortened the required construction schedule by utilizing a pre-manufactured bridge and abutment system by True North Steel. The bridge was designed to withstand typical roadway loads while providing the maximum span possible to reduce impacts on the stream. Adkins provided additional services including surveying, site design, and construction engineering. Adkins provided land planning assistance for an 87 lot subdivision application and preliminary subdivision plan. We also performed site topography, prepared design plans for lots, roads, and utilities, completed storm drain analysis, and the DEQ 1200-C Sediment and Erosion Control Plan. Adkins also performed construction staking, materials testing, construction management services, and final subdivision plat preparation for this successful project.